I painted Judge Fire in late 2011/early 2012. It was a drawn out process full of trial and error but the final result worked out. Going back to paint this spirit form was a similar experience, although I think that the full sized figure worked out a little better. All the same, its great to have the four judges and the four spirit forms finally complete. I do like the colour warmth that Fire (in either form) adds to the sombre looking group. Im not sure what I will work on for my next submission, but I am tempted to work on some Psi-Division Judges as a counterpoint to these gents. Its back to Mr Saturday for next weeks Judgement Day in the meantime. Thanks Panama (thats you Frank, isnt it?). I have been keeping painting notes in little notebooks by the painting area for about five or six years now, so knowing the exact paints and techniques used wasnt as difficult as it could have been. That said, I find that how I paint is always changing, so it can be difficult to go back to an experimental technique from years ago. It worked well enough I think. Funnily enough, due to the nature of the Dark Judges, the spirit and corporeal forms will never be in the table simultaneously anyway, so the colours dont really even need to match. But I want them too all the same. I wish I was as organised Paul – I invariably forget the scheme / colours / paints / mix and end up failing to replicate accurately! Occasionally I forget to add the final steps here and there, but by and large I keep it up to date. Using a notebook and pencil makes it a pleasingly analogue process too. I recommend it. You strike me as the sort of person who would actually follow through on it too. Aw, cool! Great to see the whole lot together, and nice job on the flames!! 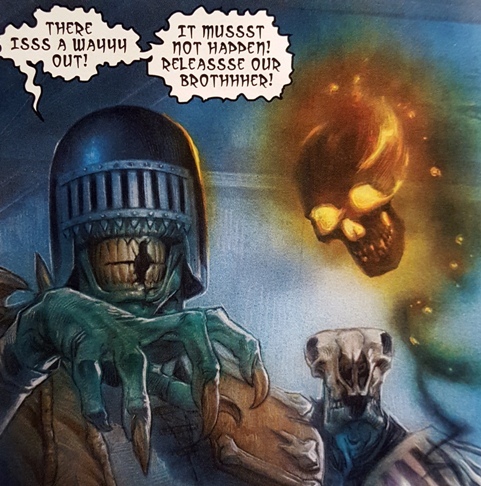 Getting flame to look even vaguely convincing is a tough job, but I think that the pretty extreme character design of the Dark Judges helps to make the rather comic book finish at least vaguely plausible. If the model was a modern, “realistic” design, like a fire in an old oil drum or something, then I dont know if it would work. Thanks for the feedback Alex. Im still waiting to hear of progress on your Angel Gang. Those guys have to hit the table along with Fire at some point. It must be very satisfying to have the set complete, they look tremendous all together. The Fire spirit looks great, I like the mouth in particular. Painting the teeth in a charcoal sort of way was a last minute decision. I had trouble with it on the corporeal version, which is why I ended up painting his gnashers “hot”, but that didnt work on the spirit form. Im still not sure about the teeth on the spirit form really. 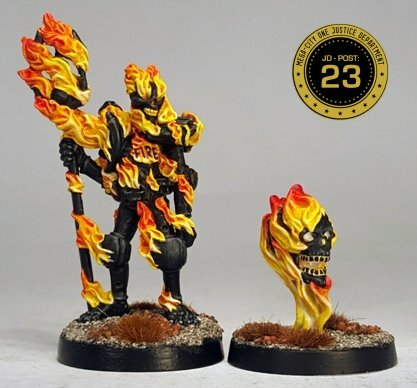 Its to do with how fluid and even translucent fire should look and how difficult it is to marry that with a paintjob that looks tight and precise, as you surely know intimately after your most recent addition to the project.. I reached a decent enough compromise I think. Thanks for the feedback. I think he worked out very well. With my own Fire, I just stopped tinkering with the flame at a certain point lest I go insane. Absolutely. I definitely didnt finish either of those models, I abandoned them. A great looking set! I think Mortis is my favourite overall, but as a quartet, they really do look the business. Did you consider painting the flames on Fire in a ghostly blue-green at any point? I would have been tempted to go down that route myself, although it may well have made them too homogenous as a grouping. I did consider painting Fires spirit form as a smouldering head that somehow floats in an ectoplasmic vapour. As a kid it slightly irritated me that Fires spirit form left a trail of smoke, while the others were ethereal/gaseous in a different way. 1) painting the fire effect was going to be difficult on its own, and for a comic accurate look, it had to feature an orangey, fiery aspect. I wasnt sure that I could get that and the ectoplasm fight on the same model without a lot of time and enthusiasm consuming trial and error, so I didnt do it. 2) in the source material, Fires spirit looks different to those of the other three – hot and smoky rather than necessarily ectoplasmic, so I was happy to tie it with that. 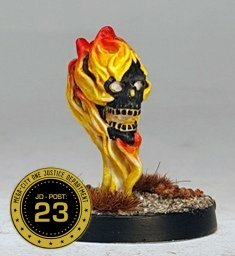 3) the sculpt is one of a head entirely wreathed in fire, rather than the other three models, which each have descending trails of ectoplasmic vapour. 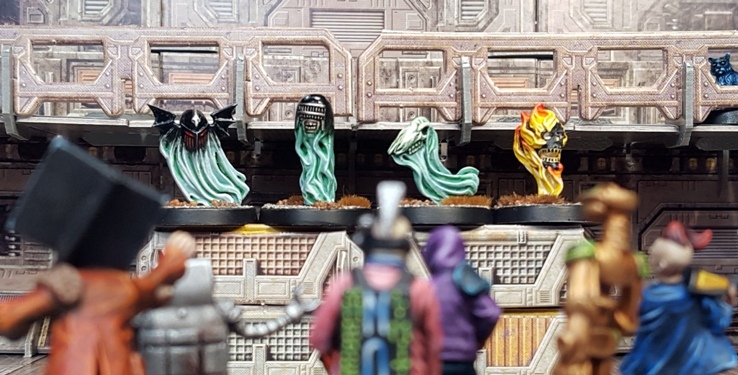 It is a nice set and Mortis is both my favourite of the four finished corporeal miniatures and probably my favourite Dark Judge character (although my opinions on that change from time to time). It is very satisfying to have the lot of them done. A nitpick would be that because l painted them over a considerable span – about 600 painted miniatures over four years by my quick estimate – that the style of painting changed, meaning that painting Fear and the spirit forms to match so much later was less satisfying than I had hoped. But regardlessproject, painted Dark Judges is categorically a bucket list thing finally finished. Ten year old me would be proud. The last tuft of grass on a base, the 7th squat an din thi scase the last complete (full time) dark judge… I really think we hobbyists live for those moments. 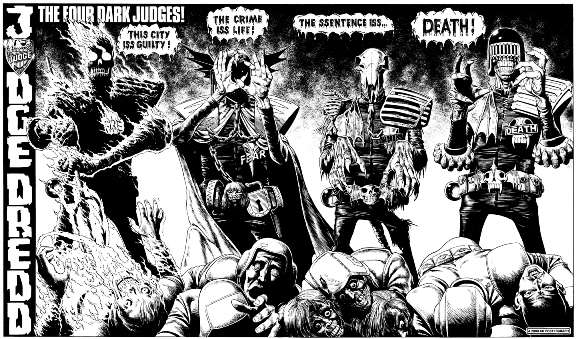 I have a few ideas for games involving the Dark Judges actually, as my projects have gradually swung in a more supernatural direction recently. A Psi-Judge or three is only the start of all that I reckon.